While on the surface this chart selection seems to have nothing to do with college, it highlights a very important factor in college and career affordability. Thanks to an analysis conducted by the Tax Foundation we get to see the relative value of a dollar state-by-state (they also offer a more detailed breakdown here). 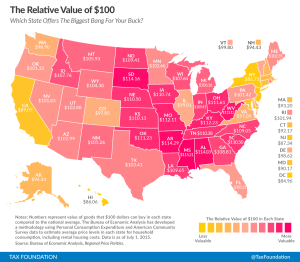 Once we grasp the concept of differing amounts of purchasing power between regions we get a little insight into our ultimate prospects for affordable endeavors. I stumbled into this phenomenon in the years surrounding my college experience. I came from a retirement mecca in Arizona but went to college in a region of Ohio where seemingly everything -groceries, gas, vehicles, housing, services – could be had for less. While there I could convert my minimum wage campus employment into cheap sustenance from Aldi and entertainment from the dollar theater. After graduation I returned to Arizona eke by by on my $8/hour wages before wising up and scampering back to rural Ohio where the same pay freed up enough money to consistently pay extra on my student loans. Keep this in mind as you explore schools and jobs. If you have two relatively similar schools of relatively similar expense, you may want to tip your interest in favor of a school in a region where a dollar buys you more. You will have to, after all, continually purchase items off campus. And when entertaining job offers don’t always bite for the higher paying gig, particularly if that would land you in a region of greater expense. In fact, I often advise youth from my area to move out of town to get their start in the South or the Midwest where it’s much easier to find cheap starter homes and hoopties to tide them over until they have enough net worth to make choices based on wants over needs. I’m sure glad I did, even if by happy accident.